Happy March! What better way to kick off the month than with an eyeshadow quad filled with lovely, rose-colored neutrals? (Spring is almost here. I can taste it. Through the snow, of course.) 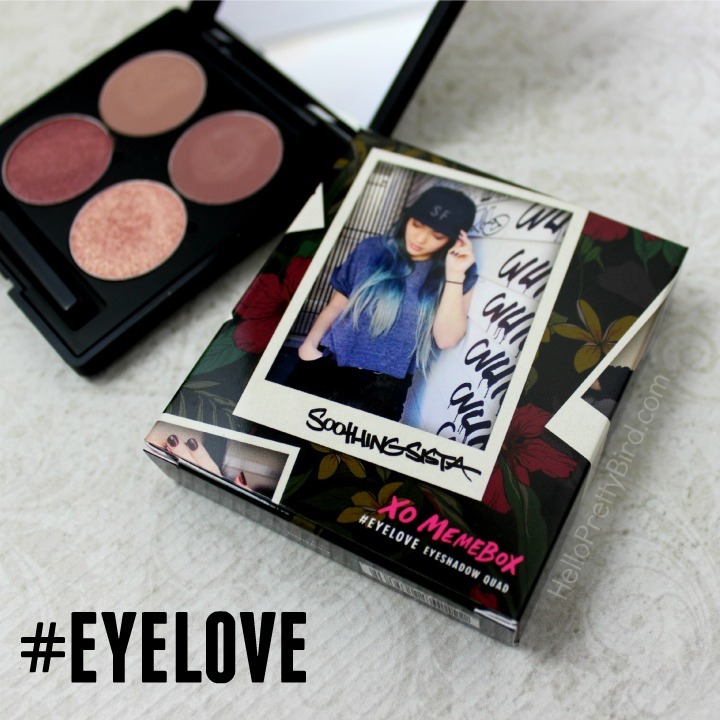 The palette du jour is Memebox's collaboration with YouTuber Stephanie Villa (AKA SoothingSista): The #EYELOVE SF Eyeshadow Quad. The net weight of this palette is about 4g, making the price per gram about $4.25. This is significantly more expensive than the Memebox X Pony palettes (check out my reviews of palette #1 and palette #2), which are priced at about $1.25 and $2.04 per gram respectively. In this case I think a slightly higher price is merited because the quality of the shadows is a bit nicer, but I suppose it's something to keep in mind if you want the most bang for your eyeshadow buck. "Stephanie Villa AKA SOOTHINGSISTA has created 4 rosy brown shades to be worn day or night for irresistible eyes! Each shade has a smooth finish with double-coated pigment technology for long lasting color. Paraben free. Cruelty free." The net weight of this palette is about 4g, making the price per gram about $4.25. This is significantly more expensive than the Memebox X Pony palettes (check out my reviews of palette #1 and palette #2), which are priced at approximately $1.25 and $2.04 per gram respectively. In this case I think a slightly higher price is merited because the quality of the shadows is a bit nicer, but I suppose it's something to keep in mind if you want the most bang for your eyeshadow buck. There's a decent-sized mirror inside. And a sponge applicator. I honestly didn't even bother with the applicator because I have other brushes that I like, but it's there if you need one in a pinch. SUTRO: A light brown-ish dusty rose color. Matte. Good pigmentation. VALENCIA: A medium pinkish-brown matte color. Heavier on the pink than the brown. Good pigmentation. CANDY RAIN: A slightly more purple-y shimmery rose color with microglitters. Good pigmentation, and nice and sparkly without being a total glitterbomb. BAE AREA: A VERY sparkly irridescent light, rosy pink. Surprisingly pigmented (at least as compared to some of the other glittery shades I've tried in Memebox palettes), but still a bit more crumbly than the other three shades. 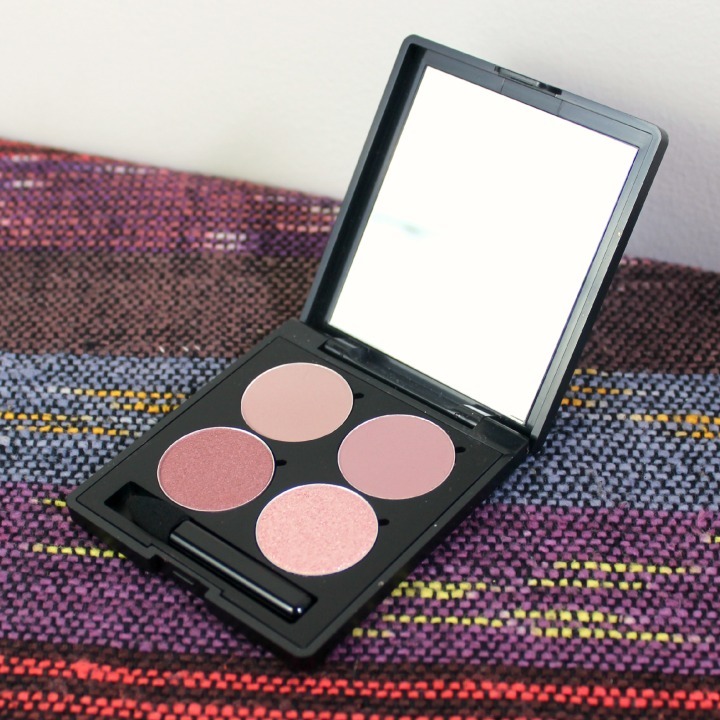 I was pleasantly surprised by the #EYELOVE quad. I was sort of on the fence about it first because I was worried that the shades would be too similar to the ones in the Memebox X Pony palettes, but they are all distinct (and very pretty). And personally I'd be more inclined to reach for rosy browns on a regular basis than the straight-up brown and beige colors found in those other palettes, so this quad is right up my alley. The quality of the shadows in this quad also exceeded my expectations. The two matte shades (Sutro and Valencia) have decent pigmentation and don't go on patchy, Candy Rain is just plain beautiful, and I was amazed at how sparkly Bae Area applies without the use of a foiling medium. That said, if you don't use a sticky base you will get glitter fallout from Bae Area on your cheeks at the end of the day. It's also much softer and more crumbly than the other three, so it takes a bit more care to apply without making a mess (think pat pat pat instead of draaaaaaaaaaag). Overall, I recommend this palette without hesitation. Unless you hate glitter. But if you really hate glitter, maybe you've stopped reading by now? 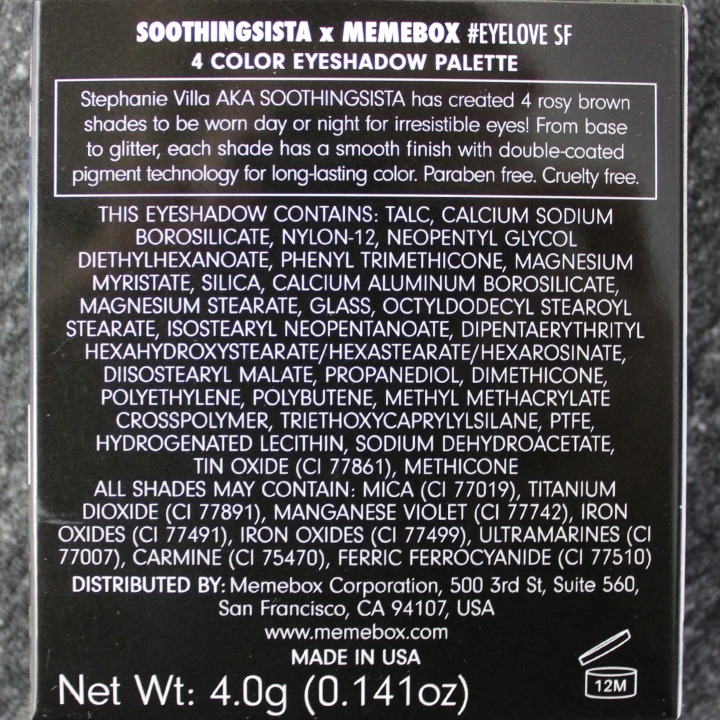 What do you think of the Memebox/Soothing Sista #EYELOVE quad? Do you like rosy browns? 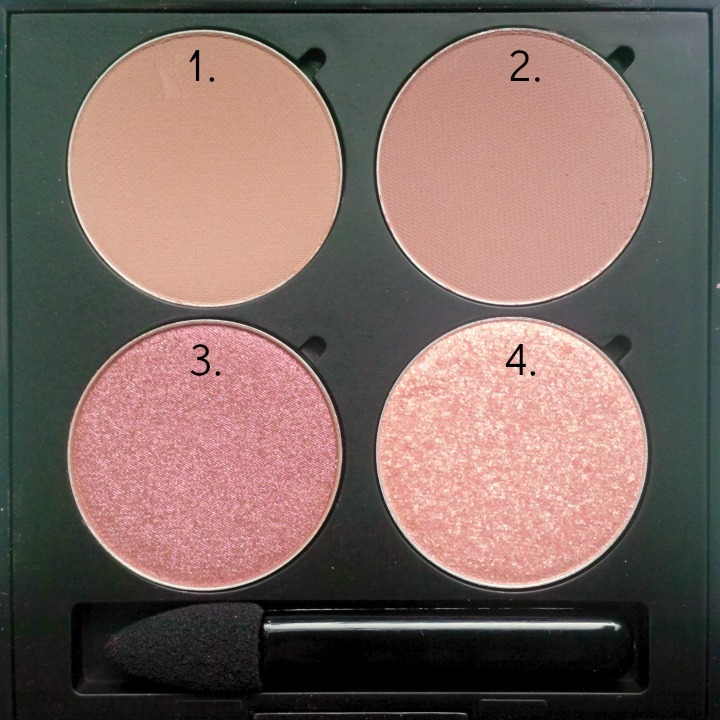 Disclosure: The eyeshadow quad featured above was provided to me for review purposes, however any opinions expressed above are honest and my own. I did not receive any other form of compensation. This post contains affiliate links. For more information, check out my full disclosure policy. 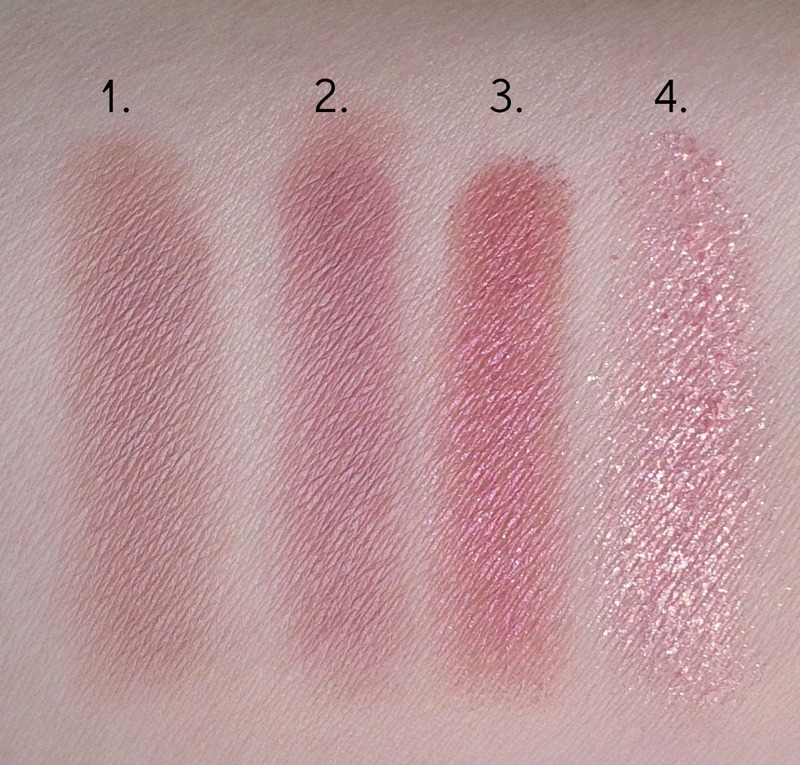 The rosy shades are really pretty and I think the tiny shadow palette is a nice idea, too. 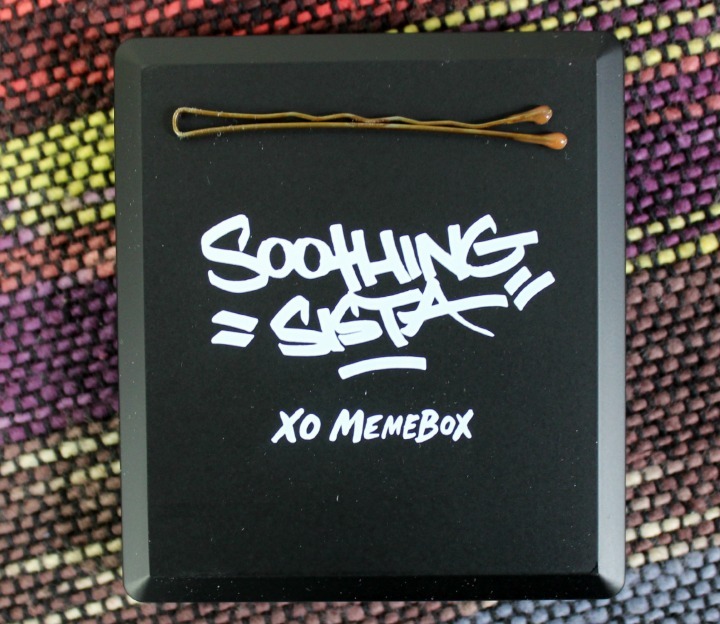 Still sad, that MeMeBox doesn't ship internationally atm. Gorgeous, I cant seem to get enough of shades like this lately. Wow I LOVE this palette. Its so gorgeous. Kinda reminds me of some colors in that Naked 3 but more brownish/rose. I agree! 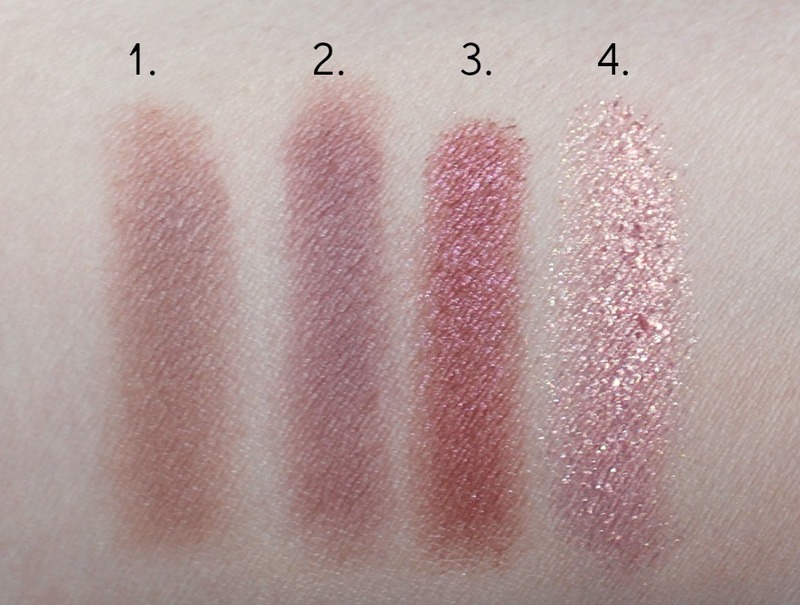 The rosy shades are the most appealing part of Naked 3 to me, so I'm really digging this selection of colors. This quad is so pretty! These rosey shades are very on trend right now! They definitely are! This is one of those trends I totally get though, because rosy shades are so pretty and really do work on a lot of skin tones. I know, right? I didn't expect it it be ugly or anything, but daaang that's pretty.